Are they orange or pink (lavender)? mine are red what do i have? Nice write-up. Most people would have gone straight to the CAI and then proceeded from there. The OEM air intake after 2001 are just was good as (and sometimes better) than the aftermarket. Like with the Crown Vics, Grand Marquis, and Town Cars, the set to get was the 2004 Marauder intake. That is, until Ford stopped making them. The 2004 intakes work almost as well. We are talking FLOW RATES to the TB. Just add a good air filter, and go. Great information! Having just recently purchased a used 2004 Mustang GT this is exactly the kind of info I need. Thanks! I noticed you tune with a deltaforce tuner. Unfortunately I do not have one of those, but I do have a diablosport predator tuner. Should I just plunk on the canned 91 tune from it for now? Would that be safe with my orange top 19lb injectors? I have a 2000 GT 5-speed. Unfortunately I do not have one of those, but I do have a diablosport predator tuner. Should I just plunk on the canned 91 tune from it for now? Would that be safe with my orange top 19lb injectors? I have a 2000 GT 5-speed. One of those preset tunes they put in the handhelds will do wonders to any vehicle,if the tune is for your vehicle. Don't expect it to feel like you have a new engine under the hood. The stock tune from Ford is setup to get you around as cheaply as possible. A custom tune (like the presets) will awaken the engine, although most do require a higher grade of fuel. Some handheld will let you make adjustments as you add to your engine; CAI, bigger injectors, underdrive pulleys. 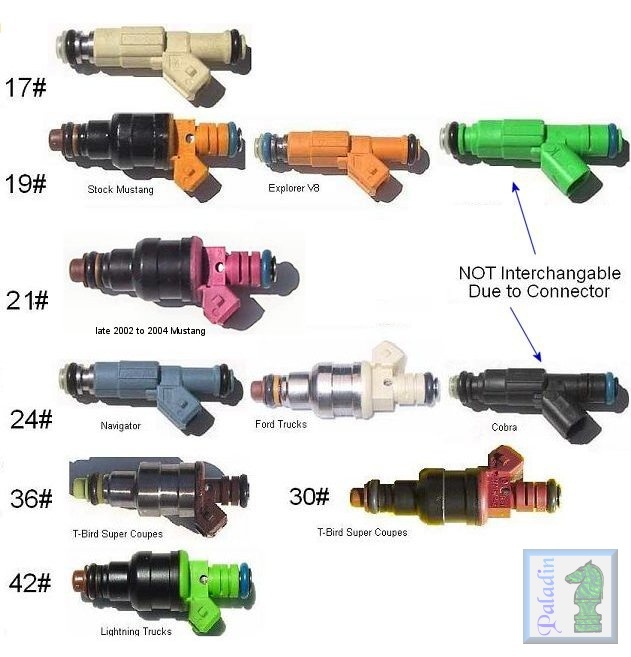 NOTE: Not all manufacturers use that color code for fuel injectors. I have #42 that came w/ my ProCharger kit and there isnt a bit of green on any of them. just sayin.